Kay Laurine Edwards was born on December 1, 1955 in Fernandina Beach, Florida to Deacon Lovett and Deaconess Narine Raulerson. She joined Greater Mt. Pleasant at an early age under the leadership of the Late Rev. C. W. Whitten. As a youth member, she sang in the youth choir, the community choir and was a member of the Red Circle. She continued to serve under the leadership of the Late Pastor Emeritus Rev. C. J. Brown. Pastor Brown appointed her as Youth Choir Director. 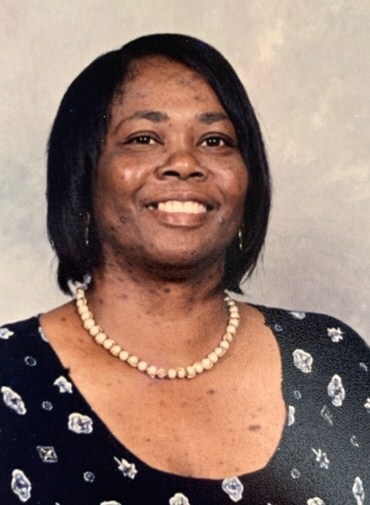 She continued to serve in the choir and Praise Team under the leadership of former Pastor Charles E. Williams, Jr. and currently under the leadership of Pastor Reginald R. Edwards, Sr. She served until her health begin to fail her. She continued to attend church and would always have her tambourine. She was a strong, faithful and motivated member. She attended kindergarten at Mrs. Mattie along with many other children of the community. She attended Pine Forest Community School until the Callahan schools were integrated in 1969 and West Nassau County High School was built. She was a member of the Class of 1973. She graduated from Bethune Cookman College, Class of 1978 of Daytona Beach, FL with a Degree in Business Administration. Kay was a member of the Delta Sigma Theta at BCC and crossed the Delta Line in November 1977. Once a Warrior and a Wildcat, always a Warrior and a Wildcat! She held employment with ITT Rayonier in Accounts Payable Department. She was employed by Nassau County School Board as a substitute teacher and later as a Par-Professional in DTOC (Day Time Off Campus Program). Her passion was sewing because she could sew any and everything. Kay met and married the love of her life Ernest “Jay” Edwards on June 19, 1979. To this union was born a son Jari and a daughter Kimberly “Kim”. They loved each other for 39 years until the Lord called her home on Wednesday, January 23, 2019. She leaves to cherish her memories husband, Ernest “Jay” Edwards, children Jari and Kimberly Williams (Kenneth); grandchildren Jari II, Christian “CJ”, Kayla, Marley, Ms. Ella, Karson and Kyren; parents, Deacon Lovett and Deaconess Narine Raulerson; sibling, Vincent Raulerson, Carlton Raulerson (Vanessa), Majorie Fagan and Melinda Aderhold (Matthias); godchildren, Crystal Smiley, Cymohr Tolliver and a host of uncles, aunts, cousins, other relatives and many friends. Special thanks to Fresenius Kidney Care, (Oceanway) Jacksonville, Dr. Cu, Pastor Reginald Edwards, Lady Latrell Edwards and Family, Phyllis Alderman and Lillian Lambert.